The headquarters of the Alberta Continuing Care Association, in the old CBC studios on the east side of Edmonton (Photo: Screenshot of Google Street View). 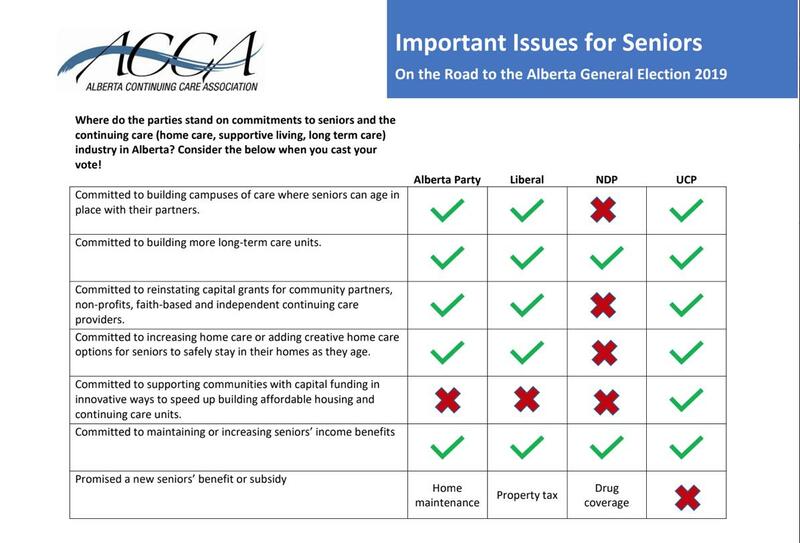 A “reference document” implying residents of private for-profit and not-for-profit seniors’ care facilities and their families should vote for the United Conservative Party has been distributed by the Alberta Continuing Care Association. In addition to creating the misleading impression the UCP is more committed to creating housing for seniors than the NDP, the colourful one-page infographic from the care facility owners’ and operators’ association seems clearly designed to make the NDP government look bad. Using visual cues and loaded language, the document headed “Important Issues for Seniors” implies the NDP is not committed to building more seniors’ care, and says the party lacks enthusiasm for “creative home care” and “innovative ways to speed up building” (euphemisms for privatization and P3s), suggesting that’s evidence of the same thing. The material in the document is not the same as more detailed information that appears on the ACCA’s public website. 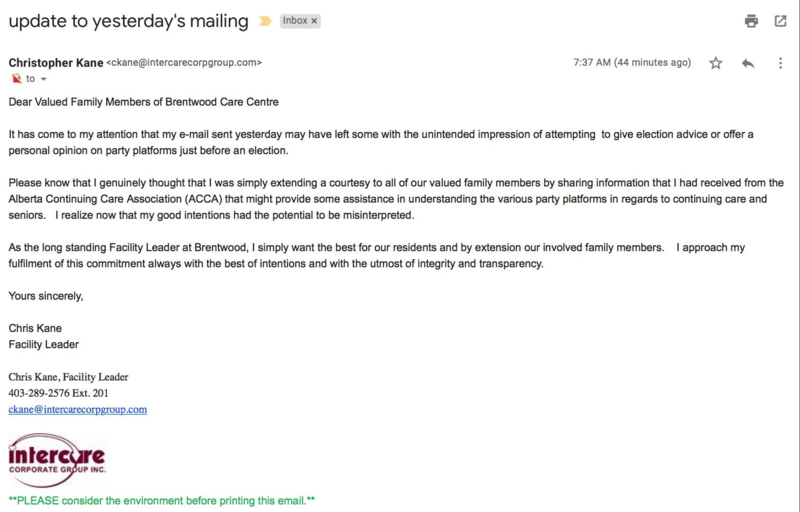 In addition to drawing attention to the ACCA infographic, an email sent Friday to the families of residents of a private, for-profit Calgary care facility – where residents include patients suffering from advanced dementia – reminded them their loved ones can vote at the facility on Tuesday. 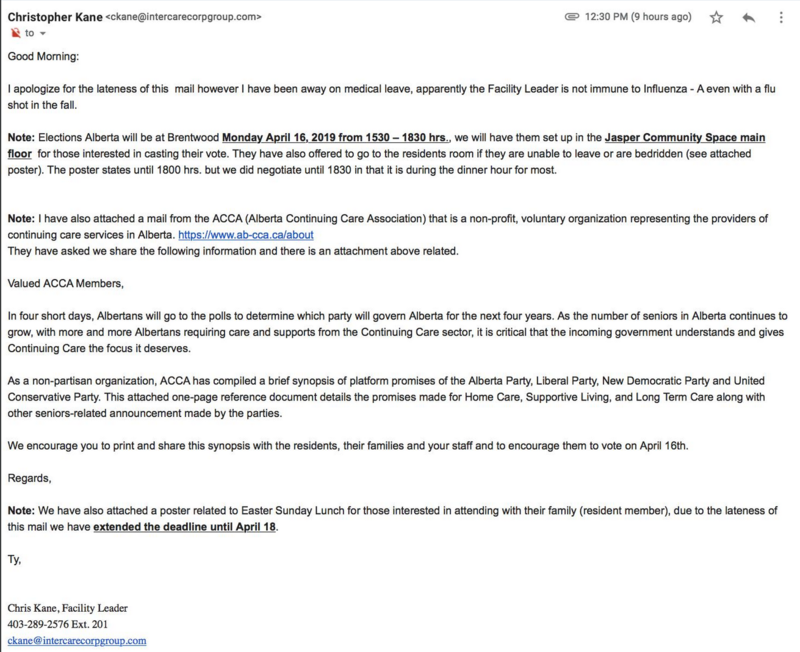 “In four short days, Albertans will go to the polls to determine which party will govern Alberta for the next four years,” the email from the Facility Leader at Intercare Corporate Group Inc.’s Brentwood Care Centre in Calgary said in part, quoting from an email he had received from the ACCA. “We encourage you to print and share this synopsis with the residents, their families and your staff and to encourage them to vote on April 16th,” the note says. The chair and five of the six directors of the ACCA board come from private-sector care providers. One is from a non-for-profit care provider. ACCA membership also includes a “corporate members” category, that welcomes insurance companies, food services corporations, and construction and maintenance contractors, among others. For many families, “affordable seniors’ housing” financed in “innovative ways” is a more costly alternative to publicly funded spaces, which are limited in number and therefore difficult for most Albertans to access for their loved ones. The blogger as art critic: If we’re paying the piper, we should get to call the tune! I read the email Chris Kane, the facility leader of Brentwood sent to their email subscribers. It appears to be very hastily written; in addition to minor punctuation errors it also gets the date wrong. There is no Monday, April 16. I wonder if this is the kind of efficient workmanship he expects of his staff members as they administer medications? Ah yes, back to pushing P3s. Here in South Edmonton we are watching the LRT being built using funds from Ottawa that were only available if we chose the P3 model. The company that is building it will operate it for, I believe, 30 years. They have just been given permission to completely close a street for the entire 2019 construction season in the hope it will allow them to meet their construction deadline. When finished it will be called the Valley Line. Personally I am looking forward to nicknaming it Harper’s Folly. One more brick in the road, as we approach the election. In the Saturday edition of the Calgary Herald, we see the usual code words brought into play. See Vivian Krause’s column. In a few days, we will know if Alberta voters are mostly intolerant religious fanatics who are white supremacists, or if most of us are reasonable people who care about others. This is not an election based on competing rational economic visions. 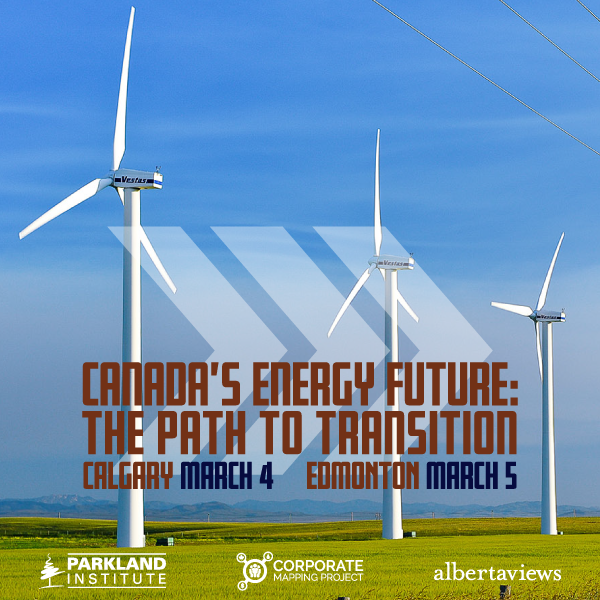 Instead it is about the hearts and minds of Albertans that will define what we stand for. If kenney wins then we deserve all the pejoratives hurled at us from the rest of Canada. Own it Alberta! Young, reasonable, and educated people need to vote to drown out the fanatics. Sadly, while there is a slim chance that Alberta voters might once again stick a finger in the eye of the pundits & the mainstream media, and grant the NDP a second mandate, I wouldn’t want to bet the price of a Starbucks Venti non-fat latte on that happening. They will probably be reduced to a healthy Opposition caucus, with most of the seats in Edmonton, a few in Calgary & a smattering elsewhere. Why? As POTUS 42’s campaign team famously said in 1992, “it’s the economy, stupid”. 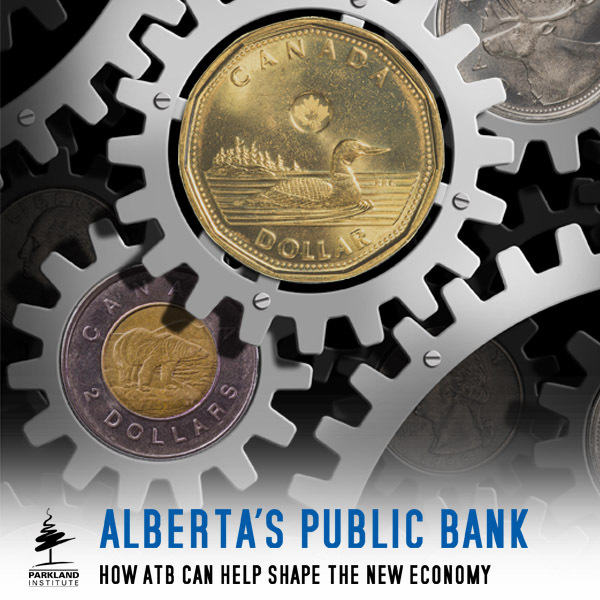 Whether you believe the alarmists that the Alberta economy is circling the drain, or the factual data which suggests it is not as bad as they say—except perhaps in Calgary—we are long past the time when the “weak of mind, strong of back” types could still make enough money for a McMansion, a 5th-wheel and three quads. We will never again see $100+ oil, and while there will still be jobs in the future, they will require a more educated and highly skilled workforce. It’s that anger—the stage of grieving that comes after denial—that’s driving the impetus for “change” from a government that has literally only had one term in office back to a successor party to one which ruled Alberta for 44 years. As for those ongoing bozo eruptions, while they might change some minds in the big cities, and maybe a few in the smaller ones, they won’t make a bit of difference in rural Alberta. In fact, they might strengthen the resolve of the right to et our and vote. LGBTQ2S+ rights in rural Alberta today are as fragile as were African American civil rights in the Deep South in the 1950s & 60s. A gay or trans man or woman strolling down the streets of Stettler or Red Deer today probably feels a bit like a black man or woman strolling down the streets of Selma in 1955. For homophobic & transphobic rural Albertans, Jason Kenney is their modern George Wallace. We knew that the former was true in the last election, hence the vote split between the mostly superitious magical thinkers and the mostly avaricious magical thinkers. Trying to take partisan advantage of elders in care is probably just as easy as taking candy from a baby—but babies don’t vote. This kind of despicable resort either indicates some kind of desperation on the UCP’s part or brands them as just perfunctorily despicable, all day, every day in every way. It is things like this that make me wonder if the UCP should change its name to the ECP (Ethically Challenged Party), but then someone pointed out to me yesterday that UCP also could stand for the Unbelievably Corrupt Party. With the all the Elections Alberta fines and RCMP investigations already going on, maybe calling them them ethically challenged is being too gentle at this point. In any event there currently seems to be a win at all costs mentality in the UCP and that attitude seems to pervade from the top down. I suppose I can understand Kenney’s motivations. I think he is looking at winning in Alberta as being a successful launching pad for a return to Ottawa. When you hear him speak it is clear he is generally more passionate about issues that are more Federal in nature, the price of canola in Wetaskiwin – not so much. If he doesn’t win in Alberta, he can probably kiss those dreams goodbye and he will never be PM. One thing that can be said about him is he is a very ambitious guy, but perhaps not in the best way and I don’t think his personal interests are necessarily the best interests for Alberta. In the same way, private care providers have their own financial and other interests, which may not be the same as their residents. 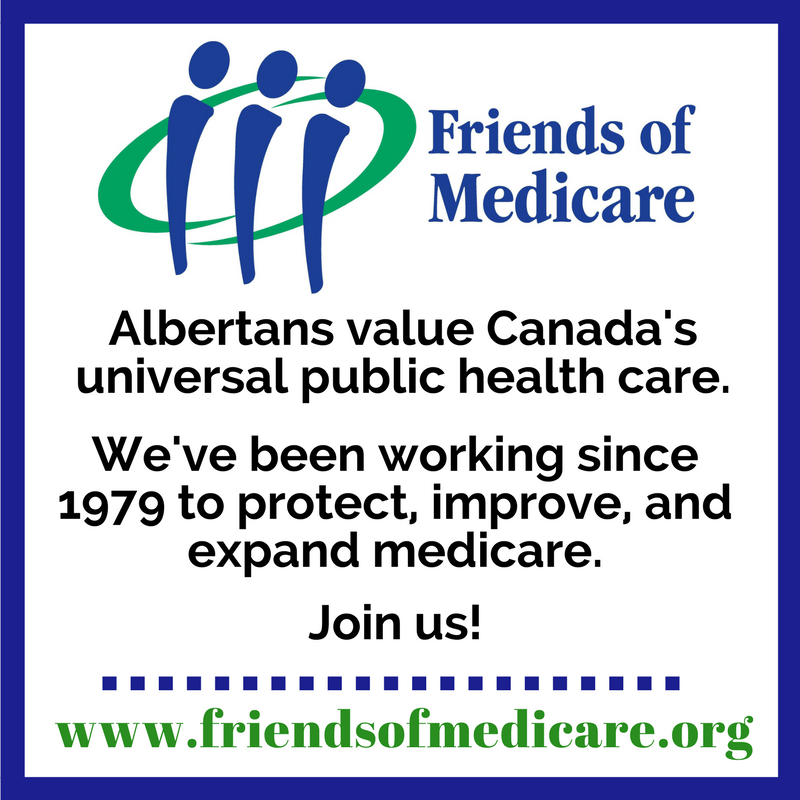 I can see why they the private care providers support UCP as its platform leans to the expansion of private care, so there may be good potential future business opportunities for them. However, this may not necessarily be in the best interest of their residents. I don’t know if they actually thought about that before sending out that e-mail more widely than they should have, or if they did and just didn’t care.